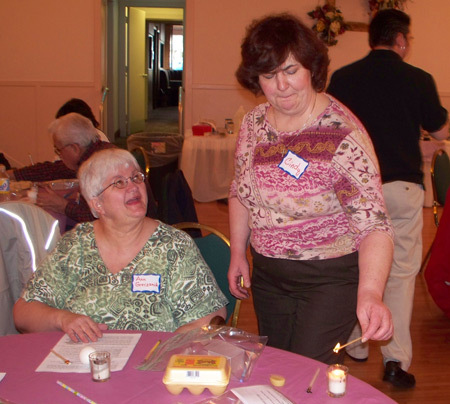 The Polish American Community was treated to a lesson in old-world Polish Easter traditions at the Polish American Cultural Center in March. 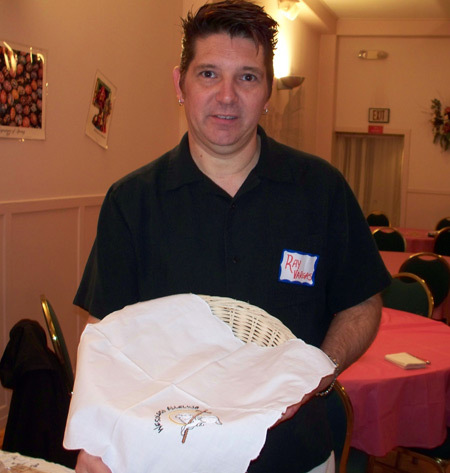 Instructor Ray Vargas, who is also Director of the Syrena Polish Folk Ensemble, showed that his skills went beyond Polish music and dance. 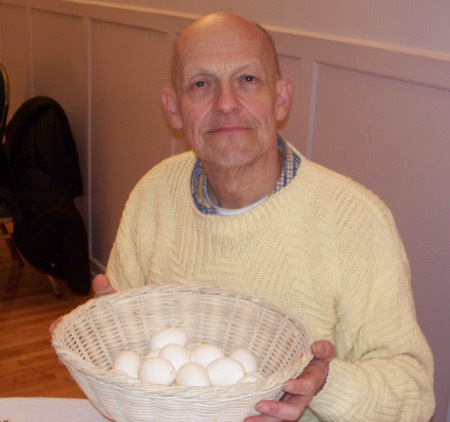 He taught the students the Polish art of palm weaving as well as dying Easter Eggs. He also brought in a number of items from his own collection. 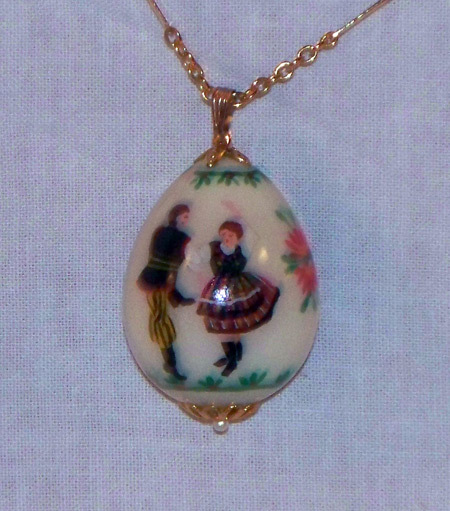 A tiny painted quail egg that had been turned into a necklace was a gift from his mother. 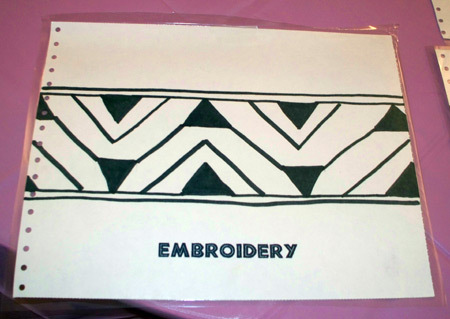 The beautifully embroidered cloths used to cover food when it is brought to the church for blessing were also designed and made by Ray. 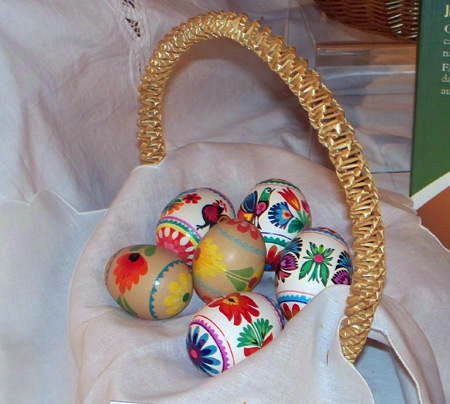 All of the eggs he brought as examples were from his collection, many from his own hand. 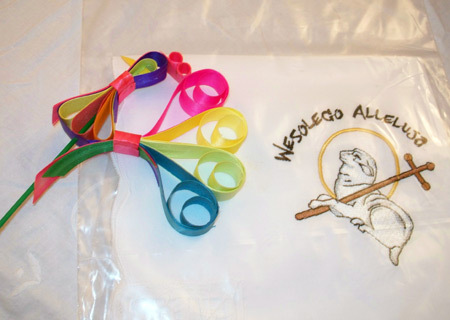 He also brought an example of brightly colored wheat painted and twisted to be used in the ceremonial march into the church on Palm Sunday - the beginning of Holy Week. "Poland is not a tropical country and therefore does not have palms." 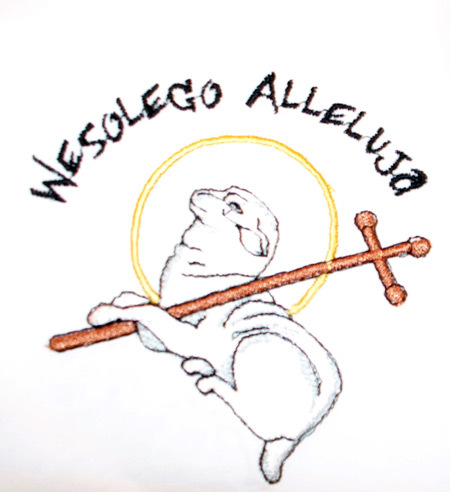 Hopefully the pictures and videos below will remind us all that the beautiful Polish Easter traditions should be preserved for future generations. The goal of the class was to create beautiful Easter eggs such as these. Ray Vargas showed how the process begins with a plan and a design. 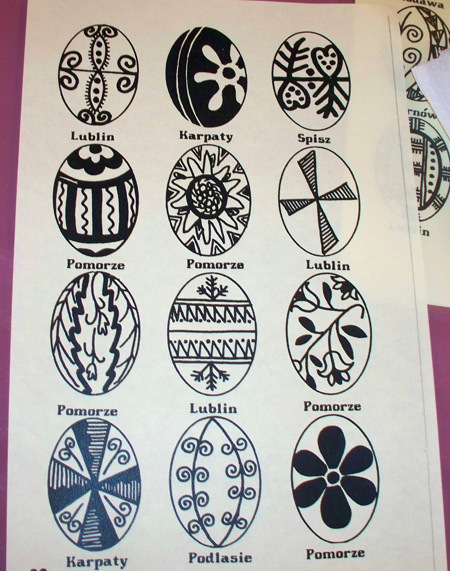 Here are some of the possible designs from different regions of Poland. The style of design is broken down further as seen in this example. 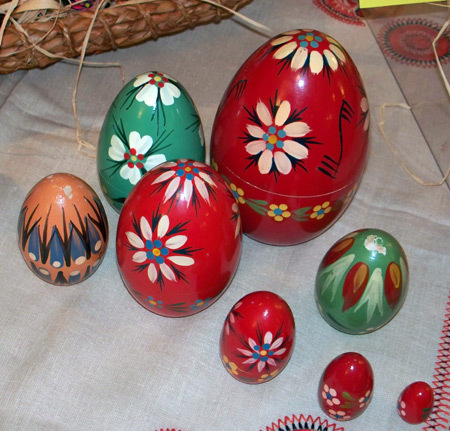 In this first of 3 videos (below), Ray Vargas discusses the design options for Polish Easter Eggs. 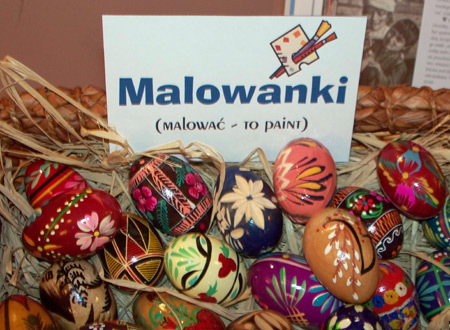 There are many different styles of egg such as the Malowanki which comes from the word Malowac meaning To Paint. 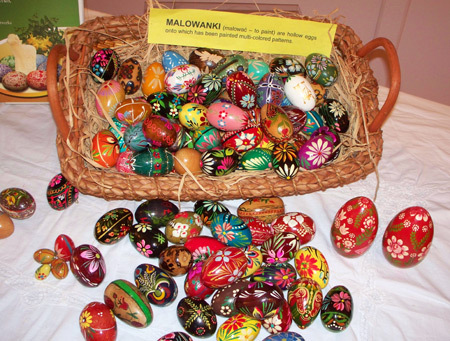 Malowanki are hollow eggs onto which have been painted multi-colored patterns. 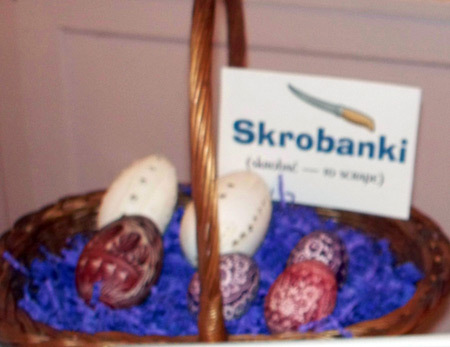 Skrobanki are made by scratching the surface with a sharp tool to reveal the white of the egg shell. 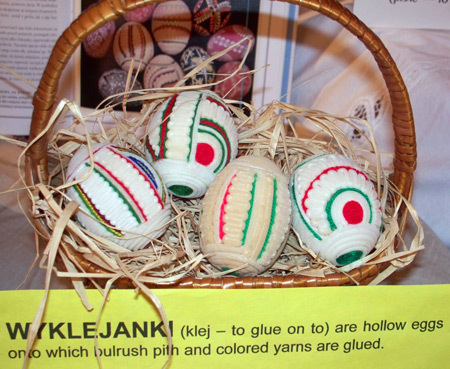 Wyklejanki comes from the word Klej which mean to glue on. 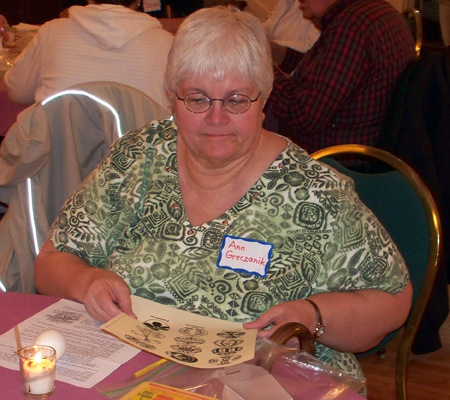 These hollow eggs have bulrush pith or yarn glued to them. They are common in the Podlasie region of Poland. 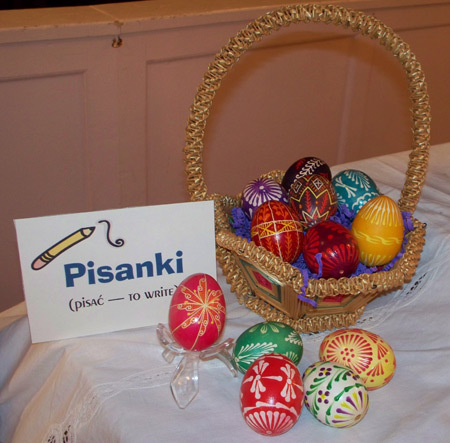 Pisanki comes from the word Pisanie (to draw) or Pisac (to write). 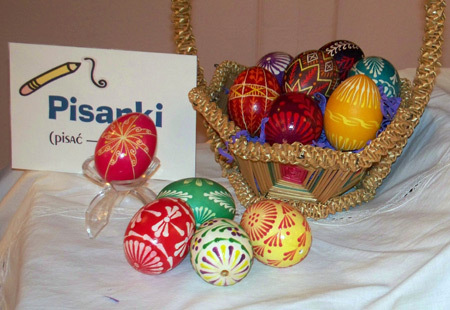 Pisanki are created by drawing designs with wax on a bare egg. The egg is then submerged into a dye. 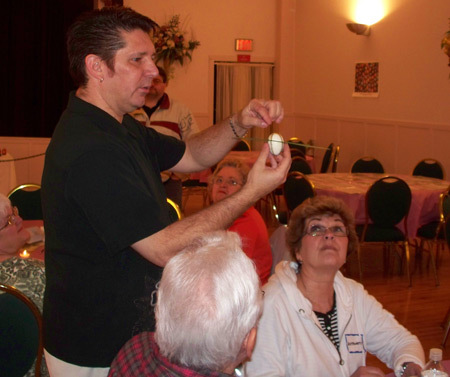 In this second (below) of three videos, Ray Vargas teaches about the colored dyes used to make the eggs. In the final video (below), Ray Vargas demonstrates how to apply the beeswax to the eggs with a pisac, a funnel writing tool. 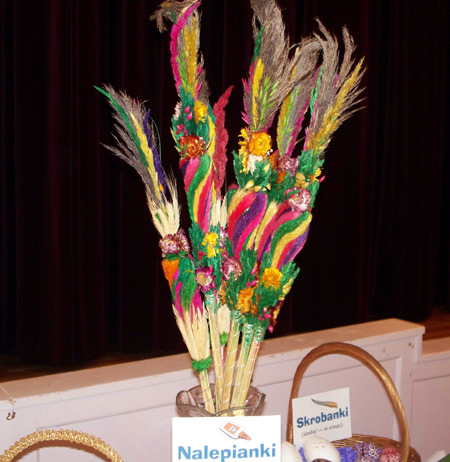 There are other traditional Polish Easter crafts such as the Nalepianki in which multiple layers of paper are glued together. 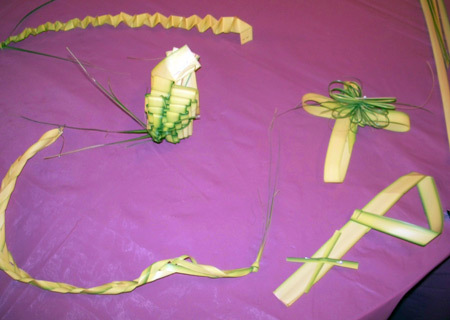 Folding palms left over from Palm Sunday is another art form. 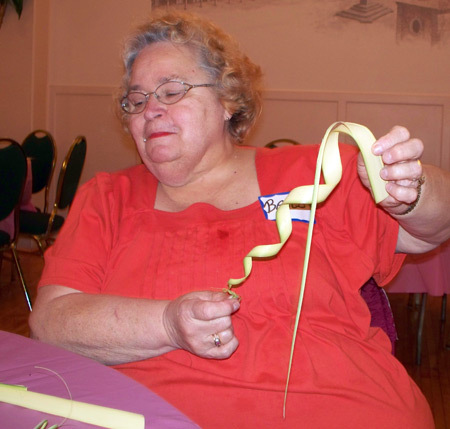 Barb Saraney showed the group how to create beautiful designs from palms. 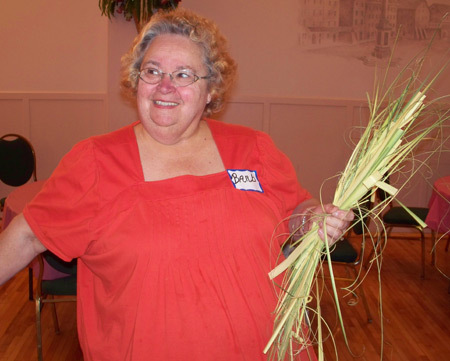 In the video below, Barb Saraney explains the traditional palm art. Ray Vargas also demonstrated some other traditions such as the beautiful wood shaving ribbons (yes, that is wood!) below.